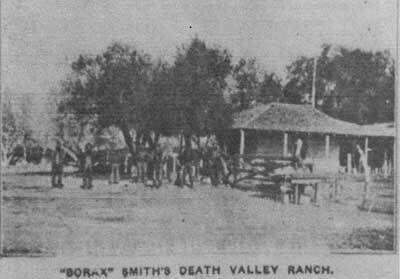 The industrial phase of Death Valley history began with the discovery of borax there by Aaron and Rose Winters and the subsequent purchase of their claims by William T. Coleman in the early 1880s. After establishing a location for his open-air borax refinery about 1-1/2 miles north of the mouth of Furnace Creek, Coleman next addressed the need for a supply point to provide essential provisions for his mules and for his workmen at this plant and at his Amargosa works. A logical place for this operation was the spot near the mouth of Furnace Creek Wash that had been homesteaded in the 1870s by one "Bellerin" Teck, an unknown and still vastly mysterious figure who live there for a short while, raised alfalfa and barley, and then seemingly disappeared from the annals of history. 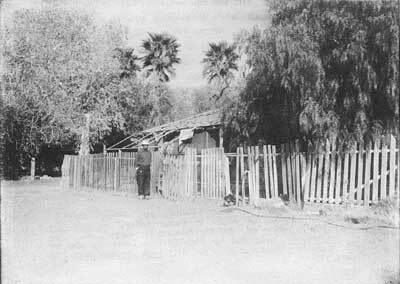 The ranch consisted of a large adobe house with a wide northern veranda, and was first referred to as "Greenland" and occasionally as "Coleman." It was given its present name by the Pacific Coast Borax Company sometime after 1889. It is recorded that about 1879 Coleman, enjoying a certain affluence at this time, sent to Italy for gardeners to supervise agricultural development of the site. At great expense the soil was scientifically fertilized and various types of trees planted in the resulting dark and heavy loam. A half-acre pond was constructed and water from the Funeral Range was diverted from Travertine Springs to the ranch via a stone-lined ditch to irrigate thirty or forty acres of alfalfa and trees. With about forty men actively employed at the borax works, and considering its vital function as a terminus station for the twenty-mule teams, where wagons could be repaired while men and animals enjoyed the luxury of a few days' leisure after their exhausting round-trip haul to the railhead, the ranch became an important center of operations. Under the guardianship of James Dayton and by dint of constant irrigation, livestock flourished in this barren desert, as did the growth of melons, vegetables, alfalfa, figs, and cottonwoods. The presence of water, shade trees, and grass in the area led to temperatures that usually ranged from eight to ten degrees cooler than elsewhere in the valley, and by 1885 the farmstead was rich in alfalfa and hay, while cattle, hogs, and sheep were supplying fresh meat for the tables of the Harmony borax workers. Initially Smith displayed none of Coleman's enthusiasm for creating a resort or other type of vacation spot at the ranch, and ran it solely as a commercial venture. As the shade trees grew and the fruit trees prospered, the spot turned into a friendly oasis frequently visited by prospectors and other wanderers in need of rest and refreshment. The buildings were improved and new tropical trees planted, but otherwise little change in the general layout resulted. While making the ditch which supplied the ranch with water, J. S. Crouch and O. Watkins slept in the running water . . . . Philander Lee . . . while at work on the ranch, regularly slept in the alfalfa where it grew under the shade of some willows and was abundantly irrigated. Other effects of the arid air are found in the utter ruin, within a few days, of every article of furniture built elsewhere and carried there. . . The ranch's location 178 feet below sea level on the floor of the valley and at the foot of the Funeral Range, (making it the lowest place in the western hemisphere where vegetation thrives), promotes such a constantly warm environment that young palms and other tropical plants had to be set in the shade of houses or older trees to ensure their survival. In summer, activity on the ranch ceased during the daylight hours, the enervating atmosphere making all but the most perfunctory tasks impossible. Mostly time was spent lounging in hammocks hung across the wide veranda. Water bags within arms reach provided necessary periodic relief. Harry Gower mentions dining with Oscar Denton on the ranchhouse porch in the breeze generated by a five-foot fan revolved by water power. The pervasive stillness of the day, however, was in contrast to the evening bustle, when ranch chores were performed and the more pleasant aspects of life--eating, drinking, and playing cards--were indulged in with gusto. Illustration 265. Pacific Coast Borax Company's Furnace Creek Ranch, about 1909. From Rhyolite Herald Pictorial Supplement, March 1909. The Indians employed as ranchhands were described by a desert photographer, Clarence Back, in 1907 as being extremely uncommunicative, often not speaking to their employer for weeks. In the fall of 1907 rumors were circulating to the effect that Borax Smith was now entertaining visions of developing his Furnace Creek ranch as a winter resort, and was even contemplating extending a branch line of the Death Valley Railroad to provide access to both his borax deposits along Furnace Creek Wash and the ranch. This plan was amplified somewhat in early 1908 into establishment of a health resort for persons suffering from pulmonary disorders and related afflictions. The climate here, especially the density of the air, its increased pressure, and the higher percentage of oxygen, were all thought to have a curative effect on such diseases. It was said that a large sanitarium plus a hotel and bathhouse would be erected. Illustration 266. 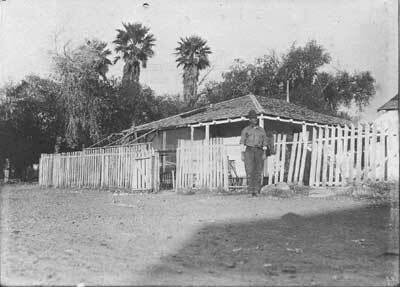 Furnace Creek Ranch, about 1915. Illustration 267. Furnace Creek Ranch, 1916. From Dane Coolidge Collection, courtesy of Arizona Historical Foundation. 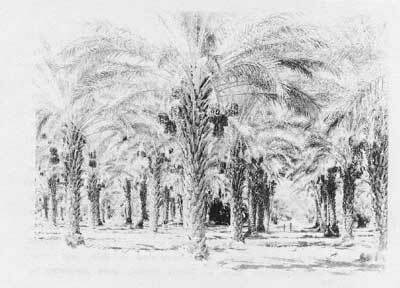 The growth of dates was introduced to the Furnace Creek ranch about 1921 or 1922, supposedly at the behest of Pacific Coast Borax Company officials who suggested it as an added source of revenue. This planned extension of the date industry in a most unexpected direction was arrived at after extensive research conducted by Dr. Walter Swingie, principal originator of the date industry in America. The man who had supervised the successful government date operations in the Coachella Valley of California, Bruce Drummond, was engaged to direct the Furnace Creek venture. In addition to some California native "wild date palms" and specimens of a Canary Island native, selected samples of the ° Deglet Noor (Date of Light) palm were also set out. This latter tree is not native to the New World but was introduced from Africa in 1898. Of the several varieties of soft dates experimented with by the government in these initial years, it quickly proved the hardiest, and now comprises most of the Ranch's present large grove. The site's comparative isolation made it ideal for growing pest-free. stock. In the 1930s fertilizer was trucked in from the Pahrump ranch southeast of Death Valley Junction to be applied to the palms. One major obstacle to their growth, the fact that were were no bees in the, valley, necessitated hand pollination of the trees. Dates have been the principal product of the last fifty years, the other experiments with winter vegetables, cotton, and citrus trees enjoying lesser success. Excellent crops are produced, and the fancy dates are shipped to market and are also available in gift packages at the ranch. During the 1920s the ranch also produced two hundred tons of alfalfa annually that were fed to a herd of high-grade beef cattle that were in turn fed to the men at Ryan. In 1930 when the hotel at Ryan closed, the borax company felt that some type of accommodations should be offered in the valley that would be less expensive and of a more relaxed sort than were found at Furnace Creek Inn. Because of their ranch's abundance of water and its level building site, it seemed the logical place for such an undertaking. Eighteen tent houses that had formed the construction camp at the inn were moved down to the site. To these were added several workers' bungalows from the just-completed Boulder (later Hoover) Dam, which were moved to the site and remodeled for tourist use. A 16 x 36-foot boarding house and cabins (now removed) from the abandoned Gerstley Mine near Shoshone were also used to bolster the accommodations. Illustration 268. Date orchard at Furnace Creek Ranch at harvest time. Photo by George Grant, 1939, courtesy of DEVA NM. Illustration 269. Furnace Creek Ranch entrance. Photo by Linda W. Greene, 1978. The highlight of a tour of the Ranch today is a visit to the borax museum, begun in the 1950s as an educational opportunity for guests. The old borax office building from Twenty-Mule-Team Canyon was moved to the Ranch around 1954, and its interior filled with exhibits on mining, Indian populations of the valley, and railroad history. Back of this structure is an outdoor museum exhibit of antique vehicles and mining equipment, including an old steel-tired buckboard belonging to Borax Smith, an early stagecoach used on the run between nearby mining towns, and other assorted wagons, plus a stamp, a ball mill, a whim, the Death Valley Railroad Engine No. 2, and miscellaneous souvenirs such as the small Death Valley Chuck-Walla printing press rescued from Greenwater and the original twenty-mule-team barn moved up from Mojave. On one side of the entrance to the Ranch is Old Dinah--the high-wheeled oil-burning steam tractor used on the Borate to Daggett route for a year or so and then put into service hauling between Beatty and the Keane Wonder gold mine in the Funeral Range. After its twenty-year abandonment in Daylight Pass, it was towed down to the Ranch in 1932 to be added to the Furnace Creek Ranch museum collection. On the other side of the entrance are some borax and water wagons. Today this Fred Harvey-owned resort offers simple wooden cabins, fancier pool- and golf-side rooms, and deluxe motel units. Opportunities for recreation are provided, including a beautiful golf course, a swimming pool, and horseback riding, and also available are an outdoor restaurant, a coffee shop, a cafeteria, a general store selling food, books, and souvenirs, a post office, and an airstrip. Trailer and camping sites are located nearby. The resort's location is enhanced by the presence of the National Monument Visitor Center immediately to the north. The site on which Furnace Creek Ranch is now located is one of the most historically significant spots in the monument. Its location near the mouth of Furnace Creek--a steady water supply throughout the year--made possible its development as a farm operation as early as the 1870s. Prior to this the area was probably visited frequently by members of the surrounding Indian populations to the north, south, and east. Little is known of the extent of this early aboriginal activity or of the life of the first Anglo homesteader on the site. The Furnace Creek ranch gained major importance as the supply 'point for the Harmony and Amargosa borax works and as the northern terminus of the twenty-mule-team wagon route between Harmony and the railhead at Mojave. Perhaps its most important contribution, if the many prospectors and other desert travelers in the area during the early 1900s could be polled, was its service in providing shade, water, and some semblance of social amenities in a harsh, often brutal, environment, and its status as a meeting-place where fellow "desert rats" could get together and socialize, swapping stories and dreams before embarking again on the never-ending quest for riches. Initially producing mostly alfalfa and hay for stock, the ranch later raised and dispersed beef to feed workers at the nearby borax camp of Ryan. An interesting sidelight to the ranch's history would be a determination of the amount of influence it exerted on the development of the various Indian groups who either resided at or visited the ranch. One would gather from the rather scathing comments on the native inhabitants presented earlier in this section that hardly any mingling of the races occurred, but it must be remembered that these observations were made by one-time visitors to the area, and fairly sophisticated ones at that. The more mundane and less "cultured" mining community undoubtedly had daily, and thus more influential, contact with the native population. 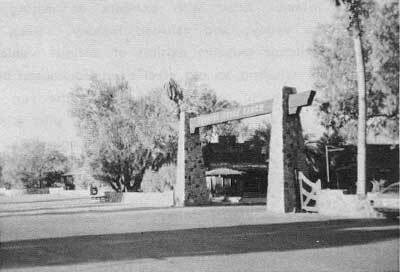 The ranch's later evolvement into a tourist resort is not considered notable because the tourist industry had already been given its start by the construction of Stovepipe Wells Hotel and then of Furnace Creek Inn. Most of the early buildings of the complex that were architecturally significant because they were a curious mixture of old mining cabins and construction bungalows imported from surrounding desert communities have long since been removed. The present structures date from the 1930s on. The site should be provided with an interpretive marker presenting highlights of the ranch's early days and pointing out its significant role in Death Valley history.